Using a very narrow screening process, I have identified a number of intriguing value propositions. I screened not only my normal universe of coverage but added two new source groupings that I think readers might find interesting. A sideways moving market is a good time to adjust strategy, including adding portfolio components at a perceived discount. 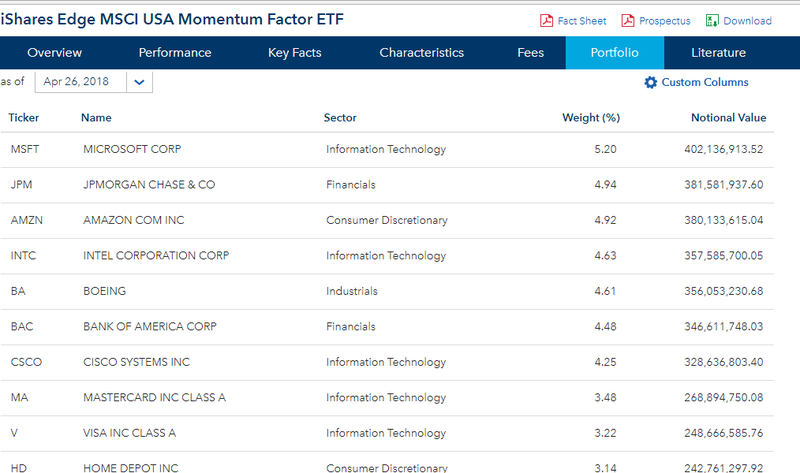 Since publication of my article "FFTY: An Elegant Solution" back on March 26, 2018, I have found myself watching the performance of the Innovator IBD 50 ETF (FFTY) versus the iShares Edge MSCI USA Momentum Factor ETF (MTUM) and Fidelity Momentum Factor ETF (FDMO) with particular interest. It was raised by one reader that both of the alternatives provided better momentum oriented ETF options and I have watched to see whether this has been proven out. My to-do list for this weekend had a couple of different article ideas I wanted to get around to, with the FFTY vs. MTUM/FDMO topic on the top of the list, but what ended up happening is something very different (and you find yourself reading now!). While FFTY seeks to replicate the Investor's Business Daily IBD 50 index, which is a rules-based momentum strategy, both the MTUM and FDMO have slightly different objectives. One thing that almost always comes under immediate scrutiny of an ETF is the fees. FFTY is at a disadvantage here, having a net expense ratio of 0.80% compared to MTUM's 0.15% and FDMO's 0.29%. JNK also has an expense ratio of 0.40%. 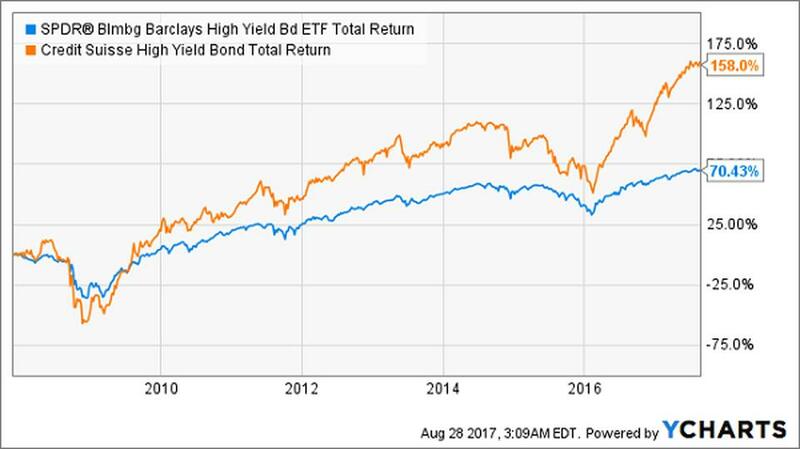 While that sounds massive compared to SPY and VOO, it's actually low for junk bonds. That's because these investments are harder to track, buy and sell than stocks, and they're more complicated. Now let's stack JNK up against an expensive actively managed closed-end fund specializing in junk bonds: the Credit Suisse High-Yield Bond Fund (DHY), with a 2.2% expense ratio, making it one of the priciest junk-bond funds there is. Let's go back to fee-obsessed math. With $1 million invested in each of these two funds, JNK will cost $4,000 per year in fees, while DHY's fees come in at $22,000. Surely, DHY can't beat JNK with such high-priced management! DHY's total return is more than double JNK's over the last decade, since both funds have been in existence. And remember that these returns are after all fees are already paid. Again, let me emphasize that these returns are after fees. That $22,000 in fees was taken out of DHY itself-investors in the fund weren't sent a bill! So this return happened after both JNK and DHY took those fees out of the fund, and DHY still won by a mile. So the penny pincher who balked at the fee math ended up with a total return of $704,300 over a decade, while the "careless" investor who looked beyond fees walked away with $1,580,000. So, having taken the stance that fees themselves would not be the beginning and end of the comparison between FFTY vs. MTUM/FDMO, let's take a look at comparative performance over several time cycles. The above 5 year chart definitely shows MTUM winning by just under 20%, with FDMO underperforming the SPDR S&P 500 ETF (SPY) by just under 9%. It is worth keeping in mind that the comparison really picks up at the launch of FFTY in April, 2015 and FDMO launched in September, 2016. FFTY did, in fact, spend the vast majority of its existence underperforming the SPY, finally overtaking the SPY in the second half of 2017 and maintaining a small percentage advantage even after recent sluggishness. As is often the case, however, a slight change to the perspective can change the overall results - in this case, looking at a 2 year chart - shows FFTY outperforming MTUM/FDMO by about 15% and SPY by over 30%. The 1 year chart shows FFTY and MTUM neck and neck within .10% of each other, outperforming FDMO by almost 10% and SPY by 14%. It is once we get to the narrowest time frames where we see MTUM and FDMO both outperforming SPY and FFTY, above in the Year-to-Date, while below, both are virtually tied with SPY with ~2.5% gains while FFTY currently sports a negative return since March 26. Over the course of the last month I have found myself, from a variety of factors, being more and more intrigued with Trading (as opposed to Investing, which is what I do now and write about here on Seeking Alpha). A part of this comes from my previously mentioned lack of stock market related entertainment options, especially over the course of the weekend. One thing I have found I am missing now that I am fully immersed in the markets again at the expense of all else is that I lack "entertaining" media to keep me occupied. During College Football season I have Shutdown Fullcast, The Solid Verbal, and other stuff to keep me entertained. Now, once Bloomberg changes over from live market coverage to whatever it is they are doing with their evening programming I have no noise for my background. About a month ago I chanced upon a U.K. television show from 2009 called Million Dollar Traders which showcases 8 regular people chosen to become the traders of a City of London hedge fund for 2 months. It was a good show in general, even if light on market related insight, but because I watched it on Youtube soon after I was presented with viewing options that included videos related to The Institute of Trading and Portfolio Management, the founder of which being Anton Kreil, a former Goldman Sachs trader who was the immediate day-to-day operations manager of the hedge fund on Million Dollar Traders. The original video that I watched in this realm is titled "Anton Kreil Annihilates Retail Brokers and "Trading Educators" and is linked there because I cannot make video embed work on this site (after literally dozens of attempts). The Financial Times (my former employer) did not take Anton very seriously back in 2009. The flip side to this, however, is like in many things there are aspects that can be taken from "trading" and reapplied to the process of investing. Simultaneous to much of the above I discovered a new tool, Tiingo, which has a number of very interesting tools that I find myself using a great deal. One benefit has been that there is a portfolio feature where I have uploaded my portfolios held in various venues so that I can watch them all in real time in one place during the trading day - much easier than logging into four different websites several times a day. Other tools on the site include an advanced stock screener as well as a correlation comparison tool. Tiingo has certainly become one of the few sites/tools I find myself using daily. The combining thread regarding the two topics above, and the first half of the introduction, is this: correlation. One thing that traders are looking for are strategies that are uncorrelated to market movements - that is, to find strategies that will be winners whether the market is going up or down. The more a holding or portfolio correlates to the overall market, the less optimal this would be. So let's take another look at FFTY vs. MTUM/FDMO in this light. I was preparing for this article under the assumption that once I opened the hood of MTUM and FDMO I would find the holdings to be some sort of mix of stocks more similar to FFTY than not - that is to say, probably a bunch of stuff I had otherwise never heard of. I could not have been more wrong on that. In fact, once I went through the holdings for both MTUM and FDMO I found that there seemed to be more stocks that are already either in my Pretty 30 or my expanded universe of coverage (or had been looked at and discarded) than not. MTUM has a total of 124 investable holdings and FDMO has 128 - but combined together instead of 252 there are 207 different holdings which means there are 45 overlapping. 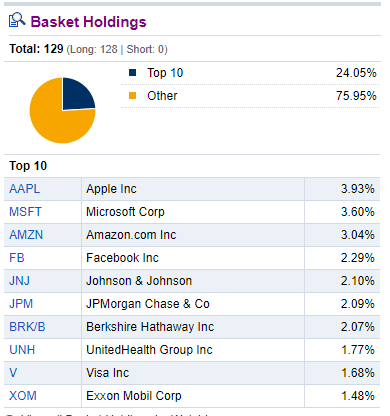 Additionally, the biggest overlapping holdings are some of the biggest holdings comprising a good portion of the Top 10. And this is just the Top 10. The trend continues through much of the most heavily weighted holdings. Which is why I think, especially in the shorter term, MTUM and FDMO are moving in virtual lockstep with each other, and most recently, with SPY. MTUM uses the MSCI USA Momentum Index methodology available here. FDMO on the other hand uses the Fidelity U.S. Momentum Factor Index methodology available here (page 14). In neither case is there a defensive strategy as is the case with FFTY, nor do I find either methodology to be as rigorous or unique as that provided by FFTY. So, if correlation is a thing to be avoided - then MTUM and FDMO are not nearly as uncorrelated as FFTY. Presently this has FFTY seriously underperforming (for the last month and YTD), but as the various time frames show, this can vary widely and FFTY has been the overall winner in one time frame (two year) and putting up market beating results in almost every other (1 year and 5 year). And in this case, what I am referring to with correlation is not restricted to just performance but instead what I am referring to as "compositional overlap". As mentioned MTUM and FDMO have ~45 overlapping constituents but like I mentioned there are a large number that already represent present holdings within my Pretty 30 portfolio or components of my expanded universe of coverage, which is comprised of stocks that will be given serious consideration for future holding. Or, alternatively, stocks I have looked at previously and which do not match up with my overarching investment thesis (so why would I want an ETF with them in it?). And to come full circle - let's come back to the original reason why I like FFTY: it saves me the cost (transaction fees, tax implications) of trying to replicate the IBD 50 myself, with the tradeoff being the (high?) net expense ratio. MTUM and FDMO have much lower expense ratios, but if what we were really trying to do is eliminate fees - and I mean all fees - does it not make more sense to trade the strategy manually? Recently I came across another broker where it makes financial sense to trade up to 100 stocks simultaneously at a really dirt cheap price - so the limitations of Sharebuilder (or even more recently Motif) as far as transaction costs have been almost virtually eliminated. Toward the end of March I had resolved myself to narrowing my universe of coverage by removing a number of stocks that did not currently meet a more rigorous criteria set. Additionally, and in tandem, it was my goal to create a "more proprietary" screening criteria to replace Analyst Recommendation Score - which is something I have used for a long time, but simultaneously, have always been keen to replace if I could find something that I could deploy. ARS has a few limitations but the largest and most universally accepted is that Sell Side Analysts are "uber bulls" - i.e., they have self-interest in maintaining positive ARS for as long as possible on individual stocks. Since I view myself as an "independent buy-side analyst", why would I take conflicted advice from the other side of the firm? Good question! And one I have been aware of for quite some time and have been experimenting with a few different metrics that could replace ARS overall. The two I have been experimenting with the most currently have to be calculated manually so are quite time intensive and because of this they are presently unusable in any screener I am aware of. Enter Tiingo! Within just a few minutes of chancing upon the site I was working on a modified version of one of the two proprietary metrics and within a few minutes of that I had deployed the custom metric and had a list of components that passed. Instead of narrowing the universe of possible components in the reverse I had the exact opposite, in literally about the same amount of time it would take me to manually calculate the metric for one individual stock. Did I mention yet how awesome Tiingo is? So now I have 107 stocks that pass this new proprietary methodology and have been keen to sit down and integrate them into my existing universe of coverage. The challenge being how to converge the two criteria approaches so that the number of stocks within the universe of coverage is not expanded by almost double - but instead narrowed to contain a better and better cohort for future consideration as portfolio holdings. Also, I happened to check the Zweig Screen and there were some new components there. Same with the IBD 50, which changes composition weekly. And now - what about these MTUM and FDMO holdings? What if there indeed was some in there that I never got around to really looking at? I started working on a deep value screen prompted by this recent Tracy Ryniec's Value Investor Podcast (again, unable to embed) to assist in my universe narrowing back in March and had yet to get around to really put it to use. The screen also matches in some respects what Chris Russell was looking to do with his screen back in December. As long time readers will no doubt be aware, the very first criteria I use is always the PEG Ratio - in this case, to pass, a stock has to have a PEG ratio of better than 2.00. Price-to-Book under 3 is a "traditional" value investor cut off for the metric, and is in no way "lowering the bar" as was the main criticism that Mr. Russell's screen faced back in December. If there was one criteria where I could have tightened the window it would have been here, with Price-to-Sales under 3. What this represents is the cost per dollar of sales - and even Ms. Ryniec says we should be shooting for a value under 1. This is very much where the wheat is separated from the chafe. FCF is a very telling indicator and the more conservative ones approach with it the fewer and fewer stocks will meet this most stringent of criteria. In this case I used the <15 band, which is not the strictest possible but close. There were 49 different stocks that appeared in three passing screens but did not pass all four, representing ~10.42% (49/470) of the original potential universe. The number of stocks that passed all 4 hurdles was a total of 22, representing just ~4.68% (22/470) of the original potential universe. It is my goal to continue the analyze the two groups - primarily the 22 fully passing and then secondarily the 49 3/4 passing stocks - to see how well a backtested portfolio would perform versus the broad market benchmark (SPY), my Pretty 30 Portfolio Strategy, and FFTY/MTUM/FDMO. Since it is now feasible to invest in up to 100 stocks in one simultaneous transaction, the restriction to 30 stocks that was the genesis of the Pretty 30 portfolio is no longer applicable. If a larger portfolio, constructed using the above selection criteria, can outperform the above benchmarks then it may prove to be a better method moving forward. It is not completely out of the realm of possibility that some combination of the above screening method in conjunction with the Pretty 30 methodology could win out. Only a rigorous backtest and real-time results over time will ultimately decide the final evolution of my stock picking formula. Disclosure: I am/we are long AB,BTI,CVX,EFC,ETN,GWR,JPM,KKR,KSU,LAD,MGA,NSC,NYMT,WBA,CAT,LMT,WM,CELG,DHY,FFTY,SPY. I wrote this article myself, and it expresses my own opinions. I am not receiving compensation for it (other than from Seeking Alpha). I have no business relationship with any company whose stock is mentioned in this article.